While in Shanghai this Spring (2010), we ate several offal dishes. The Chinese are one of the cultures that will use everything but the oink of a pig. I remembered another cooking session I had with my grand-aunt P.
I’ve never told this to anyone until now. After the chicken feet incident, I visited Aunty P for another lesson. The thing about Aunty P was that I didn’t have a choice what to learn how to cook, she did. This time it was pig intestines. Back then, butchers sold raw pig intestines. I think in this state butchers are no longer permitted to do this and the intestines have to be cleaned and cooked before sale. When I arrived, Aunty P handed me a large bowl containing two pig intestines. She instructed me to cut a large piece of ginger and shove it through the intestines. What came out the other end is something that cannot be described. The pig intestine was at least several feet long. After that, I shoved the largest garlic clove I could find through the intestines. Traditionally, cleaning the intestines involves using a chopstick to turn it inside out, cleaning the insides with coarse salt, and using lots of water to rinse. Aunty P came up with this method to supposedly save time and still get the job done. I thought the worse was over, but it got better. Since Aunty P was doing something in her sink, she told me to take the intestines outside, attach it to the garden hose and run water through it. I had to ask her to repeat herself because I didn’t think I heard her correctly the first time. So I was out in her backyard, near her long driveway attaching the end of the garden hose to the end of the pig intestine. I turned the water on to a trickle which didn’t to anything. Aunty P yelled from the kitchen to turn the water higher. OK, so in my defense, she forgot to tell me to take off the nozzle before connecting the hose to the intestine (my relatives are going to blame me anyway). So, as you may expect, the intestine went flying up in the air. It kind of looked like a kite’s tail or a Chinese battle flag. Some Chinese warlord, or Kirk Douglas character is shouting to his enemies, “I will hang your entrails on my banner so the world will know of your annililation.” Anyway, I panicked and raced to get the intestine before she looked out the kitchen window and saw what happened. I washed the outside of the intestine off and then proceeded to attach the intestine to the garden hose again (after taking off the nozzle) and rinsed off the insides. I took the intestines back into the kitchen and pretended nothing happened. I recall that she cooked in a shoyu, sugar, ginger, garlic broth/gravy, with bamboo shoots, mushrooms, and black tree ear fungus and it was very tasty. I never did tell her what happened. This is a picture of braised pig intestines (there’s that soy sauce and sugar combination again) on “cao tou”. The restaurant where we ate this is famous for Shanghai style cooking (The Cat said that Chinese don’t consider Shanghai cooking a “cuisine” like Szechuan or Cantonese). The pig intestines is one of their “signature” dishes. Both the intestines and greens were delicious. 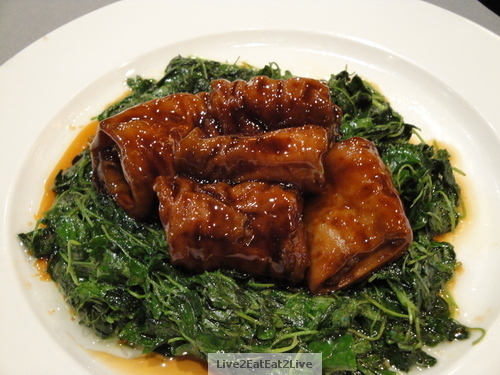 Braised Pig Intestines on "Cao Tou"
“Cao tou” is a “spinachy,” “sprouty” looking green vegetable. 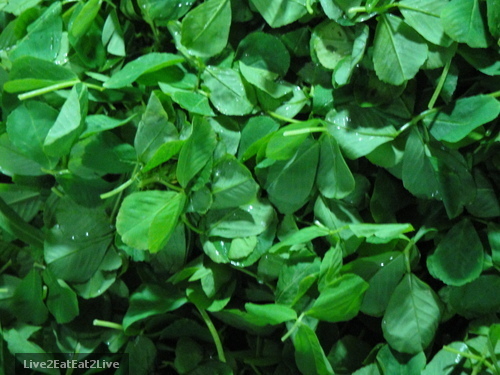 I couldn’t find the English name but here’s a picture of the vegetable in its raw form. Once again, Aunty P provided color in my life. Love ‘ya and miss you. Can pigs fly? Maybe not, but their intestines can! Hee hee. The Mouse does it again! So I’ll be darned, I was wondering what landed in my yard the other day. Now I know, thought it was a snake. Beat with a stick to make sure it was dead, (LOL) anyway, looked good to me. But I took an oath never to eat pig let alone the entrails. Did it taste good? Awesome always, todays pig is tomorrow bacon! Growing up on a German Farm/Ranch I had these same experiences……..you put a smile on my face as I long for those simpler times. Thank you for the compliment. Sometimes simpler is better. Eat well. Thanks for visiting. It’s hilarious now (after years of therapy, just kidding). Pretty traumatic back then. 🙂 Eat well. OMG Mouse did you get me laughing! Tears running down the face! I could just see those intestines flying and could hear Kirk Douglas saying those words. Thank you! I’m glad I brightened your day. I love the wisdom and the courage of cooking with intestines. Kudos to you and your feline sous chef.